My current commute project is lovely Sarah Hatton's equally lovely Edith shawl from her Vintage Inspired Knits book. 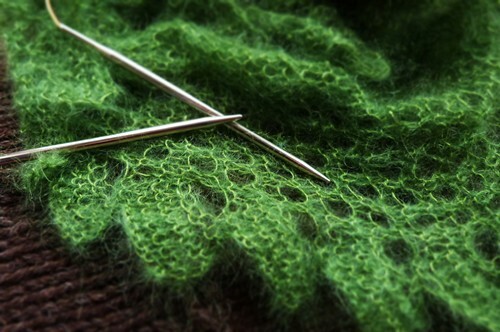 I am knitting it in Rowan Kidsilk Haze in my favourite KSH shade - Fern - and the project takes two balls. I am actually thinking it is more likely to take just a smidgen over 1 ball for me but we'll see. I had planned on knitting it according to pattern but I started knitting it during the Danish leg of Eurovision and .. I unintentionally modified it. Ahem. At least my other modification is intentional: I used kb&f instead of k1,p1 into one stitch when you increase for the border. It just flows a lot better for me. If you have read the interview which Edinburgh Yarn Festival did with me, you may remember I spoke about a colourwork hat I was knitting. Well, it is done now. It is the first finished sample from the Doggerland collection. The hat (and pattern) will début at EdinYarnFest with the knitters taking my class which I think is pretty exciting. It uses Faroese yarn from The Island Wool Company, but most DK yarns would be suitable. I can show you a little tiny glimpse of it! 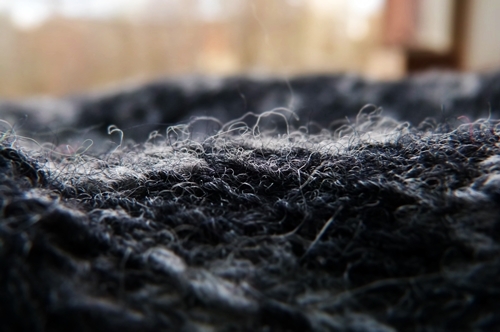 Or, as I like to call this photo, Welcome to the Woolly Landscape. Look at those rolling hills.. There are more gorgeous photos to come. I have a few patterns in next month's Knit Now (which should be with subscribers by early next week) and I cannot wait to show you.